It’s always a shock when a critic encounters a movie he thinks he was going to dismiss and then ends up entertaining him. Sure, any critic is supposed to go in with an open mind. 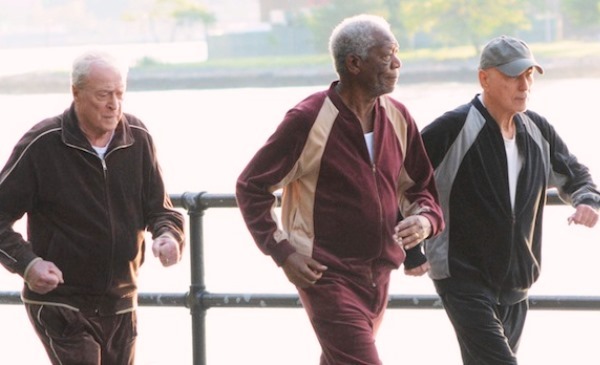 Going in Style though could still be written off as trash, but I think it is entertaining trash. And sometimes it’s a little more than that. And that’s because Michael Caine, Morgan Freeman and Alan Arkin as three octogenarian bank robbers going after retribution for the pensions they just lost, get a lot more sharp lines than I’d ever figured they get in a throwaway flick like this one. A remake of a 1979 kooky comedy about three bored old guys who rob a bank for kicks that was with George Burns, Art Carney and… (some other guy, I forget, it’s been twenty years since that flick mildly amused me)… this new vehicle is a brisk and well-tooled yarn for three actors I still regard with admiration. The gist of it is explained in one crackling speech by Caine: “We three old guys, we hit a bank. We get away with it, we retire in dignity. 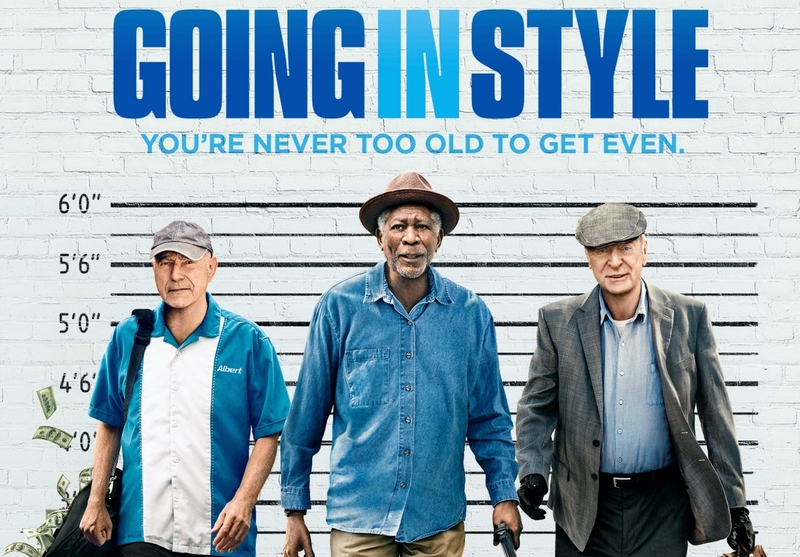 Worst comes to the worst, we get caught, we get a bed, three meals a day, and better health care than we got now.” If “Going in Style” is fluff, then well, Caine is still acting his heart out. Sure, there’s some hokey stuff throughout the movie and there are some dopes in the supporting cast (Christopher Lloyd, really, man?? ), but what I found is that slides off my memory banks pretty easy when there’s enough other good stuff going on. A practice run robbery is just darn funny, with a good bit by Keenan Thompson as the security watch who just wants to dismiss these old cronies. The big robbery that follows later itself is hammy, and not even that special if you compared it to other heist movies. But the way it plays out these three guys’ alibis in the aftermath, well, I chuckled at its cleverness. The one love interest is played by Ann-Margaret, who is still having lusty fun with roles like this. Arkin gives into her reluctantly, and asks, “I’m not sure why she likes me?” These guys are crusty, but still very much with it. I liked this three’s company, flaws and all. Film Cousins: “Going in Style” (1979); “The Bucket List” (2007); “Stand Up Guys” (2013); “Last Vegas” (2013).